Kenyan Athlete: Ezekiel Kemboi just confirmed my observations about his imminent move to the Marathon! Ezekiel Kemboi just confirmed my observations about his imminent move to the Marathon! This is a story I had written a few months ago regarding Ezekiel Kemboi's likelihood to move to the marathon next year. Then it happened. He just announced it himself in Eldoret this Thursday, the 27th of September 2018 when Isuzu company was handing over a car to Eliud Kipchoge for breaking the marathon world record. Below is what I had earlier observed. The truth is, having been in his training group for almost a third year now, I fall somewhere around the fifth place when it comes to anyone who can guess whether Ezekiel Kemboi will be running a marathon next year. There is God (who doesn’t guess, by the way), Kemboi himself, his coach and his management ahead of me. But, there are many signs pointing towards this. 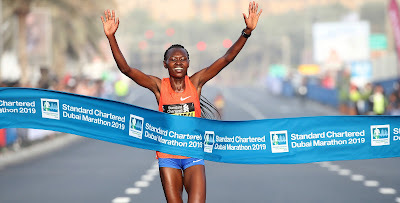 In fact, if I was to place a bet right now, even before any country can name their teams, as to who will win the 2019 world championship gold medal in the men’s marathon, I would place my bet on Kemboi. Let me explain, before you throw your phone at me! 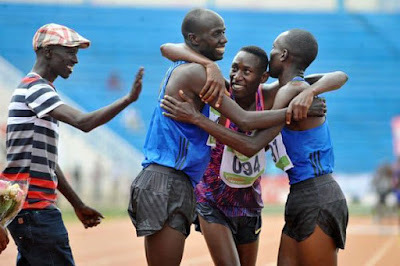 First of all, Kemboi has already hinted about moving to the marathon probably next year when asked by reporters in Kasarani Stadium during the national trials how the men’s 3000m steeplechase race he had run in had been. He replied that he was there in the race most importantly to represent the Police Service at the national championships and that his focus of late has been on the road races. Secondly, Kemboi is a big star. If he is to move to the marathon, he will definitely do it in a big way. Take for example other athletes of his caliber, like Kenenisa Bekele. Just like him, he has won gold medals in two Olympic Games. Kemboi is even better than Bekele when it comes to the number of world championships he has won gold medals having done it in 5 world championships against Bekele’s four. Bekele did his marathon debut in 2:05:04. Kemboi knows he has to be ready for the marathon before making the move. He is not just like any other average runner who can simply choose to run in any marathon, Kemboi has to maintain his world championship athlete status since there is so much involved, from appearance money to sponsorship contracts and will only be proper for him to debut in one of the big and fast marathons. If he finally makes a concrete decision to run in the spring and his debut becomes a success, then he is most likely to be named in Kenya’s team to the world championships to Doha. Thirdly, Kemboi already has got enough mileage in his legs from the many years he has been training and running on the track. He has also been slowly shifting his focus to the road races of late. Just last month, he ran a 10km road race in 27:44 to finish second behind Ishmael Kalale who won the race in 27:42 at the Castello di Arezzo in Italy. This is a very impressive time given that he had no pace setters to push the pace for him. Watch this space. It might not take long before we come here again to predict the time that Ezekiel Kemboi will likely run in his marathon debut. Is he running any races this fall? Perhaps a half marathon? He is back in training for now, not sure when he will run next.